This wreath contains Roses and Iris set amongst beautiful greenery. 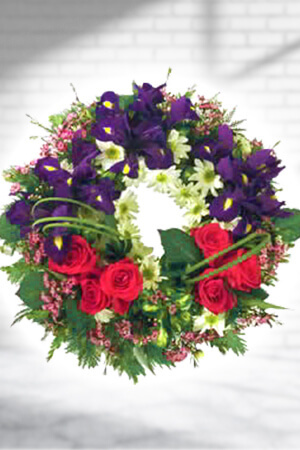 So happy to now know I can contact a florist bac home when we lose Loved ones. Pls pls Deliver Monday 27th at Wharauroa Marae. Not a home address. S I now can contact you for next time in the Future Regards Donna Tepu. Thanyou wif Pleasure. The ordering system was simple and straightforward. I just wish though your selection has a little bit more variety on the mid priced selection..
Lovely prompt and efficient service, you have made the experience as smooth as possible, thankyou.I would highly recommend zFlowers.com to all, very happy.